One of the most dynamic performers ever, Little Richard Penniman blew the lid off the Fifties with his hit Tutti Frutti, and followed it with 17 hits in less than 3 years. A consumate musician and performer, Little Richard was as adept at plying the piano as he was as he was a singer and songwriter. Little Richard pounds it, jumps on it, slides across it on his knees and moves seamlessly between it, the microphone front and center. At a concert in Baltimore, Maryland, US concert history was made when excited people had to be restrained from jumping off the balconies, and the police had to stop the show twice to remove dozens of girls that had climbed onstage to try to rip souvenirs from Little Richard. Later in the show, girls began to throw their undergarments onto the stage. Known among the greatest twentieth century musicians Little Richard became known as The King of Rock and Roll. 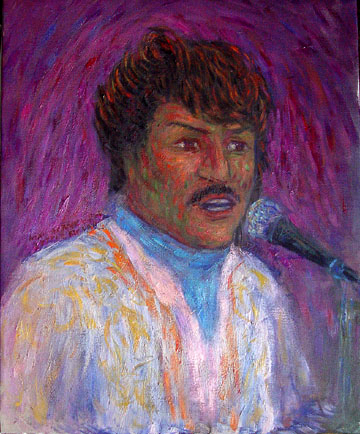 Elton John said of him "Little Richard's records were the best rock 'n roll records. ", Buddy Holly said "You can't keep still when you hear the great Little Richard. He's the wildest act in rock 'n roll…" and James Brown called Richard his idol. After retiring from Rock and Roll in 1957 to become a minister he formed the Little Richard Evangelistic Team, traveling across the country preaching, and helped people locally through a ministry on skid row in Los Angeles. Penniman returned to music for an October 1962 tour of Great Britain, with the Beatles as an opening act.